, an elegant English writer, was the eldest son of sir Thomas Lyttelton, of Hagley, in Worcestershire, bart. and was born in 1709. He came into the world two months before the usual time, and was imagined by the nurse to be dead, but upon closer | inspiection was found alive, and with some difficulty reared. At Eton school, where he was educated, he was so much distinguished that his exercises were recommended as models to his school-fellows. From Eton he went to Christ Church, where he retained the same reputation of superiority, and displayed his abilities to the public in a poem on Blenheim. He was a very early writer, both in verse and prose; his “Progress of Love,” and his “Persian Letters,” having both been written when he was very young. After a short residence at Oxford, he began his travels in 1728, and visited France and Italy. From Rome he sent those elegant verses which are prefixed to the works of Pope, whom he consulted in 1730 respecting his four pastorals. Pope made some alterations in them, which may be seen in Bowles’s late edition of that poet’s works (vol. IV. p. 139). We find Pope, a few years afterwards, in a letter to Swift, speak thus of him: He is “one of those whom his own merit has forced me to contract an intimacy with, after I had sworn never to love a man more, since the sorrow it cost me to have loved so many now dead, banished, or unfortunate, I mean Mr. Lyttelton, one of the worthiest of the rising generation,” &c. In another letter Mr. Lyttelton is mentioned in a manner with which Dr. Warton says he was displeased *. * Pope’s Works, vol. IX. Letter LXXXV. | prince, whose business it was now to be popular, tbat he would advance his character by patronage. Mallet was made under-secretary, with 2001. a year; and Thomson had a pension of 100l. The disposition of the two men must account for the difference in the sums. Mallet could do more political service than the honest-hearted Thomson. 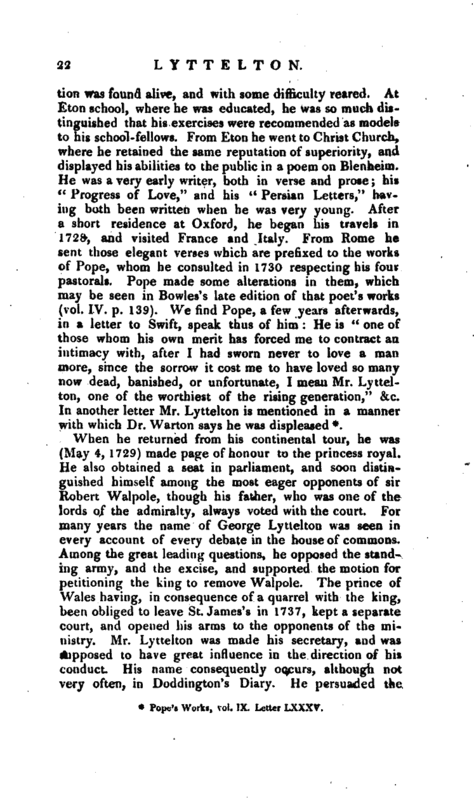 For Thomson, however, Mr. Lyttelton always retained his kindness, and was able at last to place him at ease. 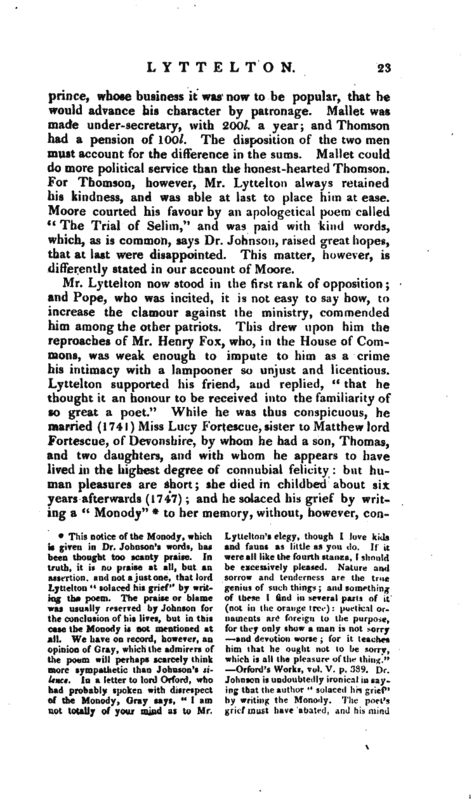 Moore courted his favour by an apologetical poem called “The Trial of Selim,” and was paid with kind words, which, as is common, says Dr. Johnson, raised great hopes, that at last were disappointed. This matter, however, is differently stated in our account of Moore. | condamning himself to perpetual solitude and sorrow; for soon after he sought to find the same happiness again in a second marriage with the daughter of sir Robert Rich (1749); but the experiment was unsuccessful, and he was for some years before his death separated from this lady. “She was,” says Gilbert West in a letter to Dr. Doddridge, “an intimate and dear friend of his former wife, which is some kind of proof of her merit; I mean of the goodness of her heart, for that is the chief merit which Mr. Lyttelton esteems; and I hope she will not in this disappoint his expectations; in all other points she is well suited to him; being extremely well accomplished in languages, music, painting, &c. very sensible, and well bred.” This lady died Sept. 17, 1795. When, after a long struggle, Wai pole gave way, and honour and profit were distributed among his conquerors, Lyttelton was made in (1744) one of the lords of the treasury; and from that time was engaged in supporting the schemes of ministry. Politics did not, however, so much engage him as to withhold his thoughts from things of more importance. He had, in the pride of juvenile confidence, with the help of corrupt conversation, entertained doubts of the truth of Christianity; but he thought the time now come when it was no longer fit to doubt or believe by chance, and applied hiniself seriously to the great question. His studies being honest, ended in conviction. He found that Religion was true, and what he had learned he endeavoured to teach, by “Observations on the Conversion and Apostleship of St. Paul,” printed in 1747; a treatise to which infidelity has never been able to fabricate a specious answer. This book his father had the happiness of seeing, and expressed his pleasure in a letter which deserves to be inserted, and must have given to such a son a pleasure more easily conceived than described: “I have read your religious treatise with infinite pleasure and satisfaction. The style is fine and clear, the arguments close, cogent, and irresistible. May the King of kings, whose glorious cause you have so well defended, reward your pious labours, and grant that I may be found worthy, through the | merits of Jesus Christ, to be an eye-witness of that happiness which I don’t doubt He will bountifully bestow upon you! In the mean time, I shall never cease glorifying God, for having endowed you with such useful talents, and given me so good a son. Your affectionate father, Tho­Mas Lyttelton.” When the university of Oxford conferred the degree of LL. D. on Mr. West for his excellent work on the “Resurrection,” the same honour is said to have been offered to our author for the above piece, but he declined it in a handsome manner, by saying that he chose not to be under any particular attachments, that, if he should happen to write any thing of the like kind for the future, it might not appear to proceed from any other motive whatsoever, but a pure desire of doing good. The copy was all transcribed by his lordship’s own hand, and that not a very legible one, as he acknowledges in a letter to his printer. See Nichols’s Bowyer. This fact is undoubtedly true. We shall not scruple, however, to add to it a trifling circumstance, which shews that the excellent peer (whose finances were not in the most flourishing situation) could bear with great fortitude what by many would have been deemed an insult. 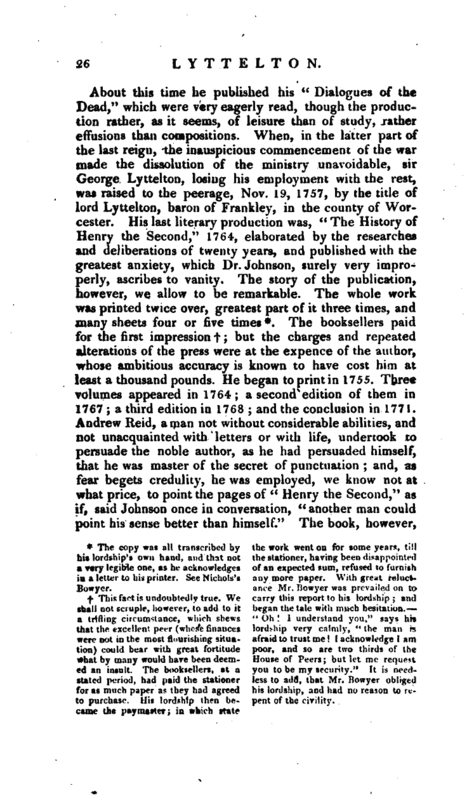 The booksellers, at a stated period, had paid the stationer for as much paper as they had agreed to purchase, fclis lordship then bee*tuc the paymaster; in which state the work went on for some years, till the stationer, having been disappointed of an expected sum, refused to furnish any more paper. With great reluctance Mr. Bowyer was prevailed on to carry this report to his lordship; and began the tale with much hesitation. “Oh! I understand you,” says his lordship very calmly, “the man is afraid to trust me; I acknowledge I am poor, and so are two thirds of the House of Peers; but let me request you to be my security.” It is needless to add, that Mr. Bowyer obliged his lordship, and had no reason to repent of the civility. | was at last pointed and printed, and sent into the world. His lordship took money for his copy, of which, when he had paid the pointer, he probably gave the rest away; for he was very liberal to the indigent. When time brought the history to a third edition, Reid was either dead or discarded; and the superintendence of typography and punctuation was committed to a man originally a comb -maker, but then known by the style of Dr. Saunders. Something uncommon was probably expected, and something uncommon was at last done; for to the edition of Dr. Saunders is appended, what the world had hardly seen before, a list of errors of nineteen pages. he lived, however, above sixty years, and then was seized with his last illness. 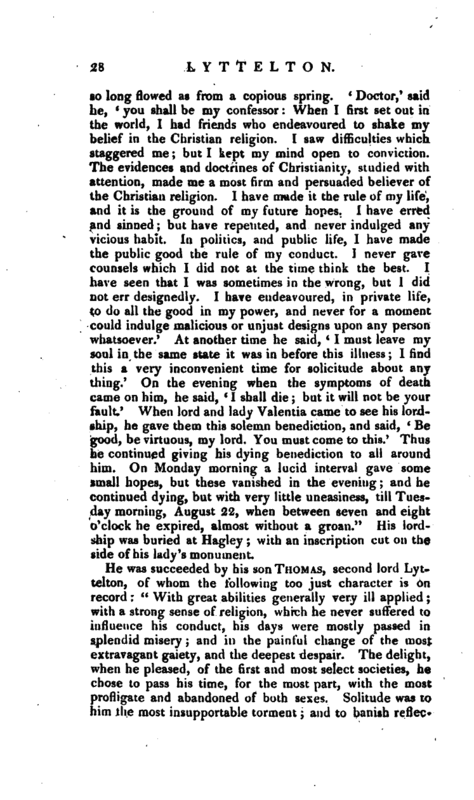 Of his death this very affecting and instructive account has been given by his physician, Dr. Johnstone of Kidderminster. 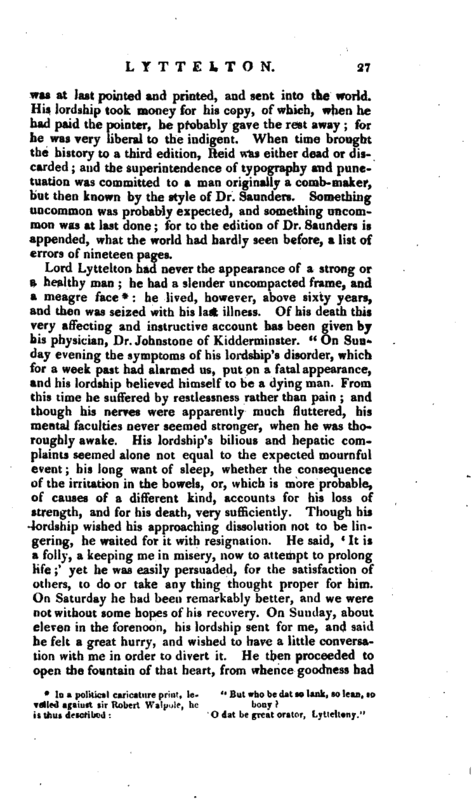 “On Sunday evening the symptoms of his lordship’s disorder, which for a week past had alarmed us, put on a fatal appearance, and his lordship believed himself to be a dying man. From this time he suffered by restlessness rather than pain; and though his nerves were apparently much fluttered, his mental faculties never seemed stronger, when he was thoroughly awake. His lordship’s bilious and hepatic complaints seemed alone not equal to the expected mournful event; his Iqng want of sleep, whether the consequence of the irritatton in the bowels, or, which is more probable, of causes of a different kind, accounts for his loss of strength, and for his death, very sufficiently. Though his lordship wished his approaching dissolution not to be lingering, he waited for it with resignation. He said, ‘ It is a folly, a keeping me in misery, now to attempt to prolong life;’ yet he was easily persuaded, for the satisfaction of others, to do or take any thing thought proper for him. On Saturday he had been remarkably better, and we were not without some hopes of his recovery. On Sunday, about eleven in the forenoon, his lordship sent for me, and said he felt a great hurry, and wished to have a little conversartion with me in order to divert it. He then proceeded to open the fountain of that heart, from whence goodness had | so long flowed as from a copious spring. `Doctor,‘ said he, `you shall be my confessor: When I first set out in the world, I had friends who endeavoured to shake my belief in the Christian religion. I saw difficulties which staggered me; but I kept my mind open to conviction. The evidences and doctrines of Christianity, studied with attention, made me a most firm and persuaded believer of the Christian religion. I have made it the rule of my life, and it is the ground of my future hopes. I have erred and sinned; but have repented, and never indulged any vicious habit. In politics, and public life, I have made the public good the rule of my conduct. I never gave counsels which I did not at the time think the best. I have seen that I was sometimes in the wrong, but I did not err designedly. I have endeavoured, in private life, to do all the good in my power, and never for a moment could indulge malicious or unjust designs upon any person whatsoever.’ At another time he said, `I must leave my soul in the same state it was in before this illness; I find this a very inconvenient time for solicitude about any thing.‘ On the evening when the symptoms of death came on him, he said, `I shall die; but it will not be your fault.’ When lord and lady Valentia came to see his lordship, he gave them this solemn benediction, and said, `Be good, be virtuous, my lord. You must come to this.‘ Thus he continued giving his dying benediction to all arourvd him. On Monday morning a lucid interval gave some small hopes, but these vanished in the evening; and he continued dying, but with very little uneasiness, till Tuesday morning, August 22, when between seven and eight o’clock he expired, almost without a groan.” His lordship was buried at Hagley; with an inscription cut on the side of his lady’s monument. We have more pleasure, however, in returning to the character of George lord Lyttelton, which has been uniformly delineated by those who knew him best, in favourable colours. Of the various sketches which we have seen, we are inclined to give a place to the following, which, although somewhat long, is less known than those to be found in the accounts of his biographers, and appears to have been written by a near observer “Few chapters,” says the writer, ``recorded in the annals of this country, ever united so many rare, valuable, and amiable qualities, as that of the late lord Lyttelton. Whether we consider this great man in public or private life, we are justified in affirming, that he abounded in virtues not barely sufficient to create reverence and esteem, but to insure him the love and admiration of all who knew him. Look upon him as a statesman, and a public man; where shall we find another, who always thought right and meant well, and who so seldom acted wrong, or was misled or mistaken in his ministerial, or senatorial conduct? Look upon his lordship in the humbler scene of private and domestic life; and if thou hadst the pleasure of knowing him, gentle reader, point out the breast warm or cold, that so copiously abounded with every gift and acquirement which indulgent nature could bestow, or the tutored mind improve and refine, to win and captivate mankind. Pennington’s Memoirs of Mrs. Carter. | good breeding: no, the benevolence of his heart pervaded the whole man; it illuminated his countenance, it softened his accents, it mixed itself with his demeanour, and gave evidence at once of the goodness of his heart, and the soundness of his understanding. ``To such as were honoured with his friendship and his intimacy, his kindness was beyond example he shared at once his affections and his interests among his friends, and towards the latter part of his life, when his ability to serve them ceased, he felt only for those who depended on him for their future advancement in life. The unbounded authority he possessed over them was established in parental dominion, not in the cold, haughty, supercilious superiority of a mere patron. 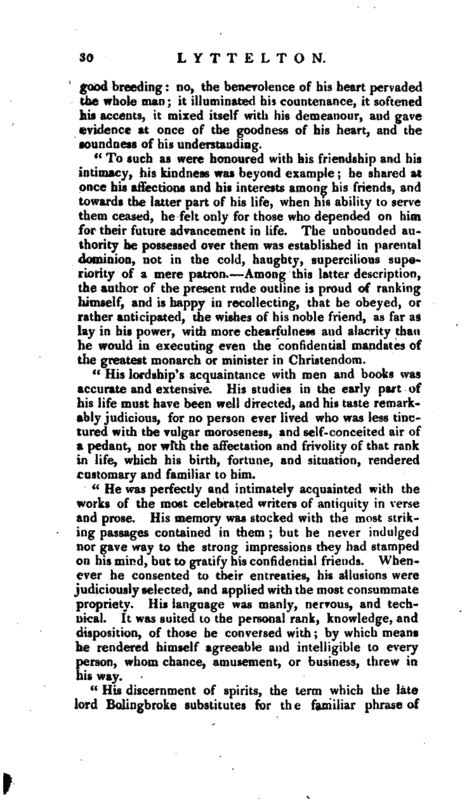 Among this latter description, the author of the present rude outline is proud of ranking himself, and is happy in recollecting, that he obeyed, or rather anticipated, the wishes of his noble friend, as far as lay in his power, with more chearfulness and alacrity than he would in executing even the confidential mandates of the greatest monarch or minister in Christendom. ``His lordship’s acquaintance with men and books was accurate and extensive. 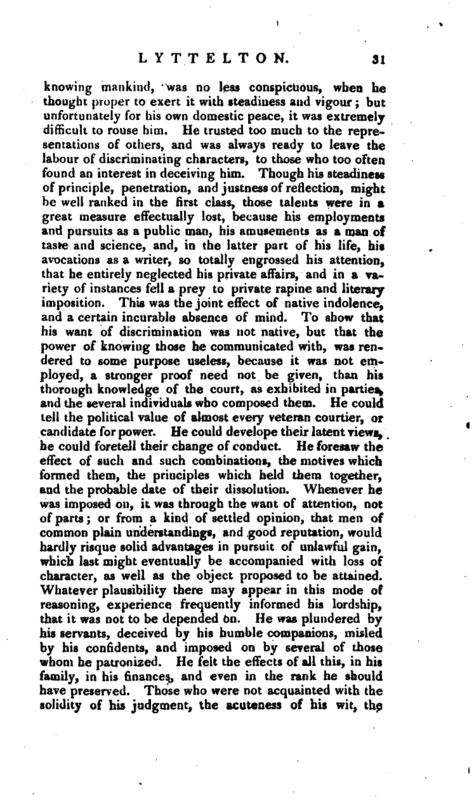 His studies in the early part of his life must have been well directed, and his taste remarkably judicious, for no person ever lived who was less tinctured with the vulgar moroseness, and self-conceited air of a pedant, nor with the affectation and frivolity of that rank in life, which his birth, fortune, and situation, rendered customary and familiar to him. ``He was perfectly and intimately acquainted with the works of the most celebrated writers of antiquity in verse and prose. His memory was stocked with the most striking passages contained in them; but he never indulged nor gave way to the strong impressions they had stamped on his mind, but to gratify his confidential friends. Whenever he consented to their entreaties, his allusions were judiciously selected, and applied with the most consummate propriety. His language was manly, nervous, and technical. It was suited to the personal rank, knowledge, and disposition, of those he conversed with; by which means he rendered himself agreeable and intelligible to every person, whom chance, amusement, or business, threw in his way. St. James’s Chronicle, Sept. 1776. Much of this character corresponds with the accounts which might be extracted from the correspondence of his friends, who were so numerous as perhaps to include all the eminent literary persons of his time. With such he delighted to associate, was often a useful patron of rising genius, and to the last was ambitious of a personal acquaintance with men whose works he admired. 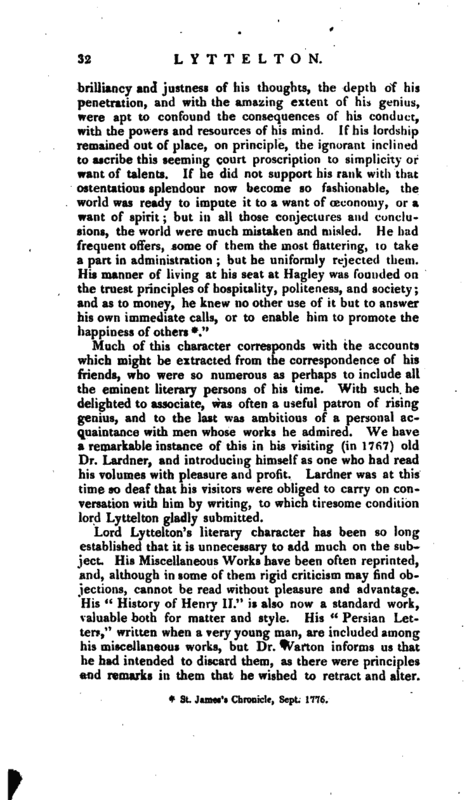 We have a remarkable instance of this in his visiting (in 1767) old Dr. Lardner, and introducing himself as one who had read his volumes with pleasure and profit. Lardner was at this time so deaf that his visitors were obliged to carry on conversation with him by writing, to which tiresome condition lord Lyttelton gladly submitted. 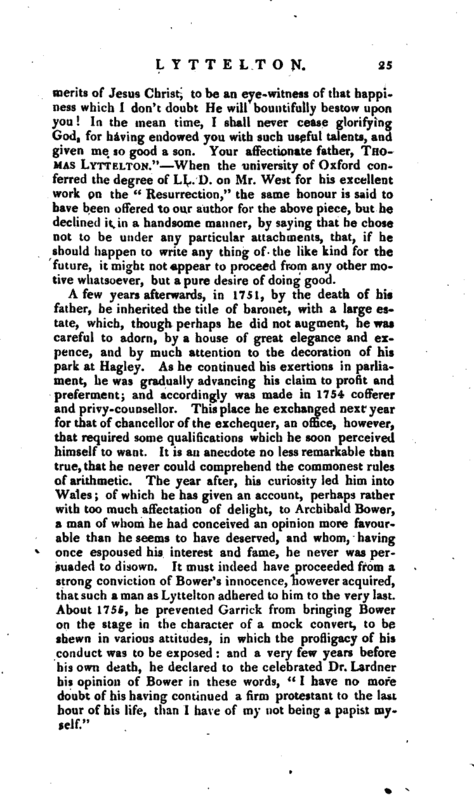 Lord Lyttelton’s literary character has been so long established that it is unnecessary to add much on the subject. His Miscellaneous Works have been often reprinted, and, although in some of them rigid criticism may find objections, cannot be read without pleasure and advantage. His “History of Henry II.” is also now a standard work, valuable both for matter and style. His “^Persian Letters,” written when a very young man, are included among his miscellaneous works, but Dr. Warton informs us that he had intended to discard them, as there were principles and remarks in them that he wished to retract and alter. | The reader finds them, however, as originally published, and they contain many shrewd remarks and just ridicule on the manners of the times. His juvenile pieces were not always his worst. Dr. Warton remarks that his Observations on the life of Cicero contain perhaps a more dispassionate and impartial character of that great orator than is exhibited in the panegyrical volumes of Middleton. 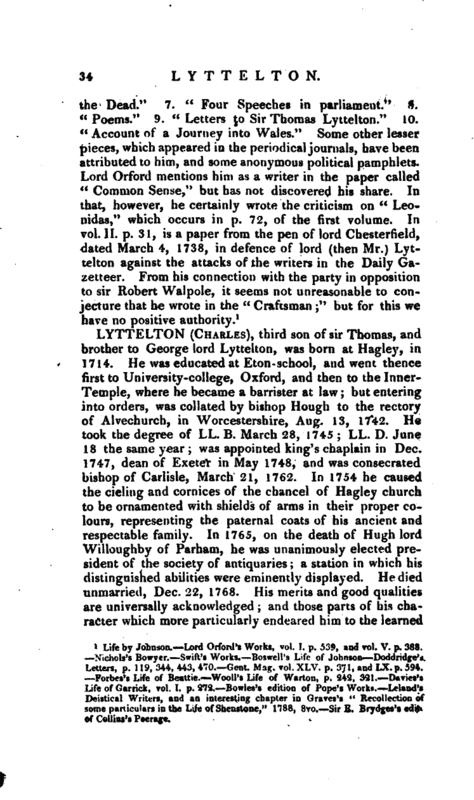 It may here be noticed that some of his letters to Warton Occur in Wooll’s Life, by which we learn that lord Lyttelton made him his chaplain in 1756. 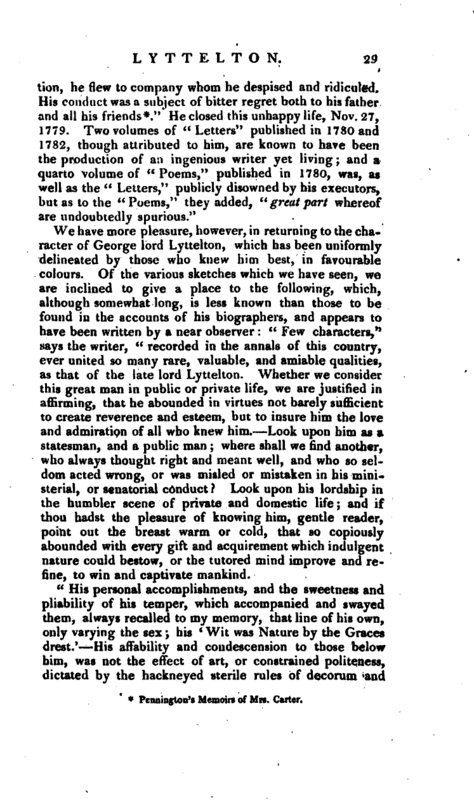 As a poet, we do not find among critics any wide departure from Dr. Johnson’s opinion. Lord Lyttelton’s poems are to be praised chiefly for correctness and elegance of versification and style. 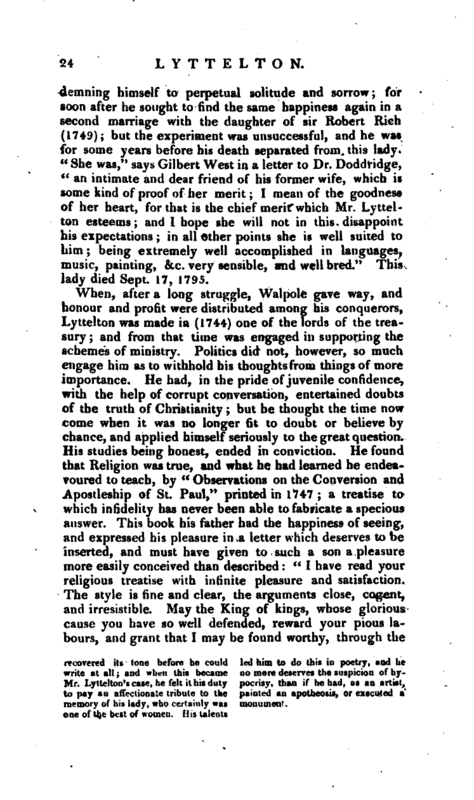 His “Advice to Belinda,” though for the most part written when he was very young, contains, Dr. Johnson says, “much truth and much prudence, very elegantly and vigorously expressed, and shows a mind attentive to life, and a power of poetry which cultivation might have raised to excellence.” As far, however, as this implies that lord Lyttelton did not cultivate his powers, we are inclined to think our great critic in error. 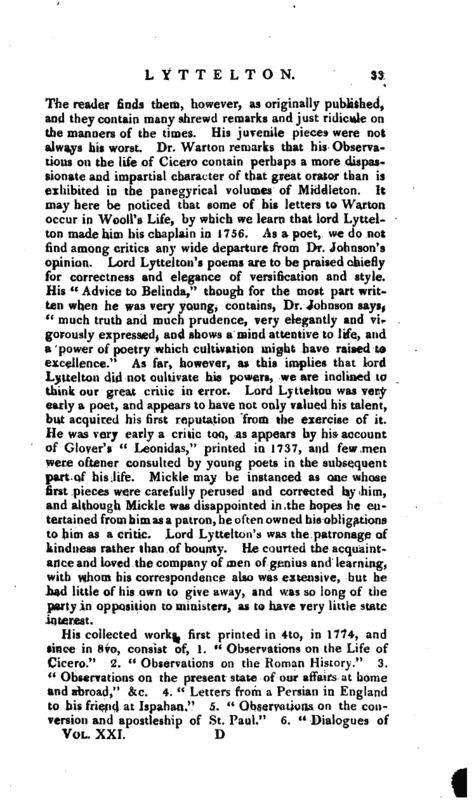 Lord Lyttelton was very early a poet, and appears to have not only valued his talent, but acquired his first reputation from the exercise of it. 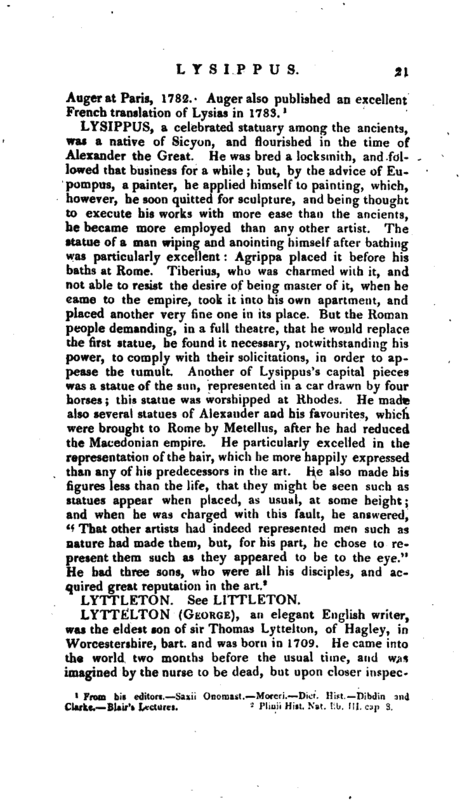 He was very early a critic too, as appears by his account of Glover’s “Leonidas,” printed in 1737, and few men were oftener consulted by young poets in the subsequent part of his life. Mickle may be instanced as one whose first pieces were carefully perused and corrected by him, and although Mickle was disappointed in the hopes he entertained from him as a patron, he often owned his obligations to him as a critic. Lord Lyttelton’s was the patronage of kindness rather than of bounty. He courted the acquaintance and loved the company of mn of genius and learning, with whom his correspondence also was extensive, but he had little of his own to give away, and was so long of the party in opposition to ministers, as to have very little state interest. Life by Johnson. Lord Oxford’s Works, vol. I. p. 539, and vol. V. p. 388. Nichols’s Bowyer. Swift’s Works. Bosweil’s Life of Johnson Doddridge’s Letters, p. 119, 344, 443, 470. —Gent. Mag. vol. XLV. p. 371, and LX. p. 594. Forbes’s Life of Seattle. Wooll’s Life of Warton, p. 242. 321. Davies’s Life of Garrick, vol. I. p. 272. Bowles’s edition of Pope’s Works. —Leland’s Deistical Writers, and an interesting chapter in Graves’s “Recollection of some particulars in the Life of Shenstone,” 1788, 8vo. Sir E. Brydges’s edit, of Collins’s Peerage.